Another episode script posted in that thread linked above. Just another reminder post for the GS5 audio drama translations. I've finally decided to resort to playing through AAI myself to get my notes in order. It's too much of a fuss to get through this messy script without some reference, and it's been long enough that I wouldn't mind playing it again. That said, this means future blog updates will be delayed, but not by much. I've been stalling for a while since I've been working on translation work on the side for DGS stuff anyhow. Wrote up another commentary, this time on the DGS eshop demo. Beware of minor spoilers and a little pre-release speculation. Considering that July will be upon us soon and I'll be playing and replaying the heck out of the game anyway, I suppose that would be for the best. Always handy to have a translator around, especially an enthusiastic one. I considered the "Shanghai route" as well, but either way works. According to one of the trailers, the route goes south and around Vietnam, rounds up through the Red Sea and the Mediterranean, and north to England. If the ship also stopped by Shanghai along the way, Holmes could, by technicality, argue that Dimiglasky could have boarded the ship then. Then again, this is the guy who could claim fish can talk and somehow find evidence for it. And that is exactly what I pictured when I first mistranslated the title of this adventure, haha. The text says Shanghai (シャンハイ) though. Also, in Japanese "sea route" would 海上ルート, not 上海ルート, so it can't be anything else but Shanghai route. Very well; updated. I agree that my eyes can deceive me sometimes, especially that I wrote all of that in one go. Sorry if I sound too nagging. I myself am very good at making the stupidest reading mistakes when I'm in a hurry, so I assumed you made a simple 海上/上海 reading mistake, because that would be something I would do (you wouldn't believe how stupid mistakes I made in the first draft of an upcoming book I translated! Heck, even in the last draft I had to correct stuff >_>). Hey, all! It's not DGS-related, but I'm back again with another silly video translation. Enjoy! ..."Silly"? I'm afraid I didn't understand. Don't worry, you're not alone. I have no idea what was going on, and I assure you no one else, not even the original uploader, knows either. Let's just say that Nick has some crazy adventures when everyone is drugged up or something. As an ironic twist, I've come to ask a question instead, and I feel like it's worth sharing here. Does anyone have any idea of what the song Gumshoe sings in 3-5, the Japanese version, refers to? I'm sure it would have been inspired by something. Apparently, the English version of that song is based on Bob Marley's "No Woman No Cry", with a few words exchanged. Naturally, it doesn't fit with the track that was playing in-game when we meet him, so it's not so easy to catch on. 'Scuse me, but isn't Gyakuten Saiban... officially translated in English? Then why are you still continuing on it? When stuff is translated from the original language to another, things get lost. Sometimes, things also get changed. 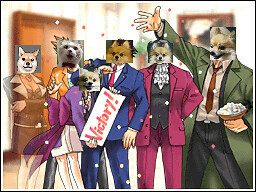 This is the case with the Ace Attorney series. Rubia speaks Japanese and so kindly provides us with a direct comparison of adaptation vs. original. Just wondering whether this is still on-going, or if it's just too much hassle finding out the right order of the script files for the games AAI onward? Technically, it's still going. It's just one of those things that happen to, uh, "drop" out of my mind at times. That AAI, GS4, AND GS5's scripts being complete messes doesn't help, but I'll try to get through them. I'm just not sure how I can work through them without playing through the games themselves. And even then, I don't have the time to stick to them for long, so I don't make much progress. It's times like these where Youtube playthroughs will greatly help after all, even if they might not get every piece of dialogue. I'll see if I can wring some time for this again. Thanks for sticking with it for this long even without any news, Ash. I really appreciate the support. Did you know Charley has a blog on the official GS fan site? I've taken the liberty to compile and translate the palindromes. There be some summaries of the blog entries too, so come take a look. I swear I do not make up this stuff. It's one of my favorite blogs to follow. Oh, gosh. This latest translation job has taken me waaay too long. I've been putting it off here and there... but I've finally finished it! Take that! Incidentally, this means I will finally be able to return to my primary project and the reason I started up this thread in the first place! I ALWAYS try to KEEP MY PROMISES!!! *cough* Anyway, with Thanksgiving around the corner, I may just have some time to get started on AAI again. Please look forward to it! I HAVE NOT FORGOTTEN ABOUT YOU MY PRECIOUS THREAD! With the AA anime coming close, my blog project may actually become relevant again. I've already cleaned up the entire blog to relevant / informative posts (at least, up to the latest posts in the past few days). I've also added a few pieces here and there to cases 1-2, 1-3 & 1-4 for more clarification. I may eventually do another overhaul of the old posts to make them look a bit more organized and uniform... eh, if I have the time. For now, I'll pass this spoiler-free "cheat sheet" to prep everyone for the anime. It includes the corresponding English & Japanese names, as well as a few pieces of trivia to go with them. I'll update it as I go. It's been a year and half-ish since I last touched on this project. I'm happy to announce it's been revived. So far, I've gotten the AJ character profiles done, and I'm expecting the DD and SoJ ones to come along tomorrow and the next. If Ash or someone can check my work, I'd appreciate it. Thanks in advance! The saka in her last name is the kanji in sakarau, which means “to disobey, defy”. (It’s also the first kanji in Gyakuten Saiban, but that’s probably just coincidence for once.) It also comes from her nickname “Ikasama Sakai”, as in “Cheating Sakai”, which is also a palindrome. masaka is an expression of disbelief, like “Impossible!” or “No way!” It also fits well with her last name as a sort of tongue twister. Sakai is named after Takumi's senior in high school, who had the nickname Ikasama Sakai. yatai is “food stand”, and the name of his stand backward so happens to spell yakibutaya, which is a a food stand for ramen noodle served with roast pork. As someone who loves his noodles and yatai, I am quite sure nobody refers to ramen stands with roast pork as yakibutaya. I mean, save for specialist ramen restaurants, most restaurants will serve chashu (which is never read as yakibuta in this case) as it's probably the most common topping around, so that wouldn't work it all. Aren't you mixing it up with the brand name yakibutaya (of which Google showed me several exist)? I’m not sure what inspired this name in particular, but katagi means “honest, upright”, as in “an honest citizen”. So, uh, I guess these “Rivales” guys are actually pretty good-natured gangsters? Trivia: Actually, Takumi got this name from a dentist’s office in his neighborhood. Katagi is yakuza-slang for non-yakuza. So the normal people. As in "We yakuza don't bother no katagi, we keep our fights to our own!" You'll hear it very often in the Yakuza games too (with Kiryu bouncing back and forth between the katagi and gokudo life). maki means “curl” or “roll”. He does have some curly hair, doesn’t he? It also can mean “wrapped up [in]” depending on what verb it’s paired with; perhaps like how he’s been wrapped up in something beyond his control? His last name is from the phrase toraba-yu, from the French word “travail”, meaning “job change”. For what it's worth, Takumi's official statement is that he forget about where the name came from. hamigaki is literally “brushing teeth”. shoutarou is from… shotacon; that is, the shoutarou complex. Uh… at least he’s got the blush stickers? Hamigaki was originally the name for a rakugo artist who was supposed to appear in the game. So something-something-tei Hamigaki. For his real name, Shadi Enigmar, it’s Nanafushi Kagerou. nanafushigi is the “Seven Wonders”; his first name is the same as from the Shadi Smith entry. Nanafushi and Kagero are both insects, though my gut feeling would be that the pun's na wo fuseru/名を伏せる/hide a name. Actually, I thought back to a 4koma comic series from the AJ anthology that made such a joke. I figured it's more of a brand name than an actual category of yatai, but thanks for the clarification. Though, it kinda leaves me lost on what the pun is. There's a lot of odd scrambled name puns from this case, so that's how I thought. Right, that's what I meant by including "honest citizen", but I suppose it could be made clearer. Oh, that's interesting. They played with the idea of adding in a rakugo artist this early on in the series? I guess that's partly why adding them in SoJ felt somewhat out of place compared to the rest of the game. Thanks for the heads-up. I wonder if Zak is actually a bug enthusiast, and if that interest passed onto Trucy somehow. Ah, right. Here's the DD one. Forgot to post it earlier this morning. I ought to be finished with the SoJ profiles later today (that is, past midnight, so it'll probably be the next day). kaku may refer to “square”/”cube” and sumi can be “corner”; probably referring to how she’s been hit. Her surname and the first syllable of her first name make kakuho, or “guarantee”, which seems to play into her English name. kakuhou also means “confirmed info”. sumi can be “corner” -> Wrong corner. Sumi is something like the 'inside' of a corner, like in 'there's a closet in the corner of the room' or 'trace a line towards the corner of the surface'. The corner you can hit yourself on is a kado. I'd simply read her name as is, so kakuhozumi/in custody　(確保済み). zeni refers to Capcom’s fictional currency “zenny”. The other way around: Capcom's fictional currency is based on the real zeni (銭), the actual character used in the name. uratori refers to “gathering evidence” as for a news story. The ura in particular means “back”, so her “gathering evidence” is suspected to not be very upfront. The 'back' here does not imply anything shady. The meaning of the 'back' here means to check out in detail if something checks out (i.e. "Don't just look at the front, also check the back"). If the police were checking up on an alibi, you'd also refer to that as 'ura wo toru', and there's obviously nothing suspicious, nor sneaky about them doing that. I might not be able to get to corrections right now, but duly noted, sir! For now, I just wanted to update with the SoJ profiles. Here. Khura’in was taken from the Kurain we know, which in turn may have been taken from the Klein Bottle. Actually, Takumi stated long ago that is indeed the case. Perhaps his first name is from seijou (清浄), meaning “clean”; as in, he was innocent of the crash incident. That's a different "clean"; 清浄 is clean in the religious sense (cleansed, purified). Thanks as always. Finally got the chance to update. If I may hazard another guess, could Yonekura Seiji be from nekura na seji (世事)? He seems to be pretty gloomy about everything. Also, I don't remember how Lady Kee'ra, the Holy Mother's sister, was called in the Jap. Did they give her a specific name? 世事 is really large concept, 'world affairs', 'world news', 'society', so it sounds kinda weird too, actually. Nekura is a human personality trait, while seji is an abstract concept. Nekura on its own is also used as a noun who are 'nekura', and I don't think you need to take it as an adjective here. Hmm. Well, I'm outta ideas. Seems like the mystery of Yonekura will be thrown into the unsolved AA mystery pile with Robert Hammond's name origins. Thanks. And I'm sure she had a real name (it's Ihmsan in English), but I'm going to have to search through 6-3 again for it. I don't remember which part it was when we go fetch Maya's scroll. Edit: Okay, found it. Looks to be the same. I've updated the post one last time. Her real name is Ihmsan, which is the same in the JP version. I’m not sure about the whole pun here, but imu is a verb meaning “to avoid, shun”, like a taboo. It’s supposedly taboo to say her name. Totally forgot about the name, but I see it was イムサン, so the pun is probably イムサン → 仏サン　→ 仏さん (note that this does not mean Buddha; it means a dead body, like 'look like's we've got a new corpse on our hands'). 忌む in the meaning of shun/avoid/taboo is in regards to being shunned/avoided/tabood/detested because something is (religiously) unclean, like the concept of death in Japanese indigenous religions (I avoid saying shinto, as save for fairly modern political reasons, shinto was traditionally never one unified religion in practice). It's not a taboo because of fear/rules/etc. Happened to take a look today, but is the site deleted? It's still the same blog, but expanded to incorporate Yakuza / Ryu ga Gotoku stuff since I've lately fallen into a sort of abyss. Maybe I'll do some localization stuff with that series too, so it's not just a mess of reblogs. Not sure yet. Maybe by taking the lazy route through it I can get something contributed to it again. I really need to clean up my tumblr blog. IT HAS BEEN LITERAL MONTHS SINCE I LAST CAME ON HERE. How many of ya'll still remember me? For the record, I'm posting here again because I have good news and bad news. The good news is now that I've hit a whole month of break for the holidays, I want to celebrate and stop by again for nostalgia's sake. The bad news is I don't like tumblr anymore, for reasons other than the new community guidelines in effect today that will send people jumping ship to other sites, and I'm currently in a dilemma over whether or not to jump ship as well and bring my GSvsAA project and information to a new site or here. Also, doing so will most definitely help reorganize the blog so it does what it's originally designed to be and not this reblog mess of random art and memes that have flooded my blog the past couple years. If I do share it on here, I will use a new topic. This one ought to be sent to the archives already. I barely use it after all. And rest assured, when I do set up that new blog on another site, I will let you all know. Welp, I've decided to jump ship after all, but I won't be abandoning tumblr entirely. If you're following me @gyakutengagotoku right now and still want to follow me, I suggest following my other blog @rubiaryutheroyal instead. I have started up a new blog at https://gsvsaa.blogspot.com/ and I will be moving all of my GSvsAA project there henceforth. The old blog will remain for another 2 months from 1/2/19 and then it will be deleted. In the meantime, I will be porting all my previous posts over and reformatting, updating, and correcting anything that needs it, so it will actually feel like an organized database of information. Thanks for staying with me, folks. It's a new year and it's time to renew.